Shine Gold Tours India offers full-day Delhi sightseeing tour packages in a luxury air-conditioned car, or in a larger vehicle if you have a bigger group. If you are coming to Delhi from another city we can also arrange your stay in a hotel according to your budget and choice of place. Old Delhi was founded by Mughal Emperor Shahjahan in 1639 as Shahjahanabad. New Delhi is the capital city of India, planned by Edwin Lutyens, a famous 20th-century British architect. New Delhi is known for its wide streets and tree-lined boulevards. It houses numerous national institutions and other important buildings. The temple was officially opened in 2005, and since then it has been consistently a top tourist destination in Delhi. It is situated on the banks of river Yamuna and houses many buildings of all sizes. At the centre of the complex, there is a huge temple made entirely of stone. Enjoy exhibitions that tell the life of Lord Swaminarayan and the history of Hindu religion, the musical fountain, and extensive landscaped gardens in the temple. 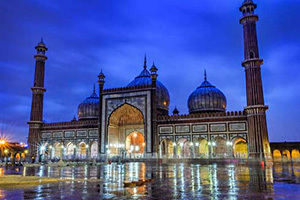 Jama Masjid is considered as the biggest mosque in India. It was built by Shahjahan in 1656 AD. Thousands of Muslims gather here to offer Jummah ki Namaz (Friday noon prayers). Chandni Chowk is the most popular tourist street of Old Delhi. It is famous for its amazing food, and is probably the best place for shopping in a real Indian bazaar (market). Chandni Chowk starts from the Lahori Darwaza (Lahore Gate) of the Red Fort, and finishes at Fatehpuri Masjid. The Red Fort is also known as Lal Qila. Located in the old Delhi area, UNESCO declared Red Fort a world heritage site in 2007. It is a massive fort built by Mughal Emperor Shahjahan. Building started in 1638 and was completed in 1648. Since 1947, on every 15th of August (India’s Independence Day), the prime minister of India unveils the flag on Red Fort and addresses the nation. Raj Ghat is a memorial to Mahatma Gandhi, who is considered as the greatest follower of non-violence and peace in the history of mankind. Visitors are required to remove footwear before entering the memorial. The India Gate is a war memorial situated in the heart of New Delhi, built in the memory of soldiers who were martyred to bring India its independence. This 42m tall memorial is a popular tourist destination in the city. The Qutb Minar stands 73m tall. It’s the tallest brick and stone minaret in the world, situated in south Delhi. Qutb Minar is also an officially declared UNESCO World Heritage site. Bahai temple (popularly known as Lotus Temple due to its shape) is a prominent tourist attraction in New Delhi. It was built in 1986 and serves as the mother temple for followers of all regions. This garden is spread over 85 acres. It contains the tombs of many rulers of the Lodhi dynasty. In the middle of the garden is the Bara Gumbad, consisting of a large rubble-constructed dome. Humayun’s tomb was constructed by Mughal Emperor Humayun’s wife Hamida Banu Begum in 1562; its design is based on Persian and Mughal architecture. Humayun Tomb is one of the major historical monuments in the capital of India and also a UNESCO world heritage site. You can customize your Delhi tour package and choose whichever place you want to visit during sightseeing in Delhi.